Deck Replacement by ECO-WOLF, INC.
Benefits: Each 5 Gallon Self-Leveling kit will fill approximately 800 cu. in. • Seacast™ is “Green.” It has 35% recycled FRP which gives it “SUPER STRENGTH”. • Seacast™ is nearly twice times the strength of a marine plywood deck. • Seacast™ is only 3 tenths of a pound lighter than a marine plywood deck, which will not endanger, alter or negatively impact the structural integrity of the boat. • Seacast™ does not crack, creep, rot, or freeze. • Seacast™ has excellent impact resistance. • Seacast™ floats and does not absorb water. • Seacast™ is drillable and tappable - as easy as wood. Seacast™ was developed by the late inventor Wolfgang Unger. He recognized the need for a tough, lightweight, durable, and affordable replacement system for the marine repair industry. Seacast™ permanently replaces rotten wood and soggy foam from transoms, stringers, decks, and flooring. Note: Self-Leveling Seacast™ is for decks and flooring. Seacast™ is a high strength casting compound combining reinforcements and additives in a proprietary resin matrix. Seacast™ is formulated for heavy duty applications that need strength and durability, i.e. motor mounts. 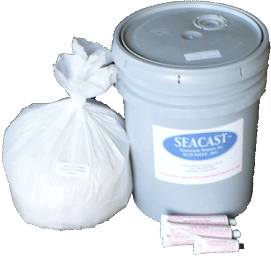 Seacast™ comes in a bucket with premixed resin, BPO catalyst, and premeasured reinforcement. Note: (1) Seacast™ Spacer Blocks and Seacast™ Spacer Bars are designed to maintain a consistent gap opening to avoid bulging and/or collapsing of weak skins. 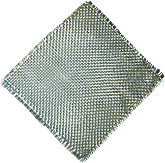 Our spacers are made from Seacast™ and will bond to itself, with no cold seam. ALL the wood must be replaced with Seacast™ to ensure safety. No Silicone or Epoxy. (2) If you have an aluminum boat, you will need to apply a thin layer of Aluminum Adhesive Bonder by roller, spray, brush, or flow-coat method. (3) Metal and bristle, in 3" or 6", rollers and PVA Mold Release Paste is also available on our site. Disclaimer on Limitation of Liability: Since the Seller exercises no control over Buyer’s application or use of the product manufactured by Seller, and since material used with the product may vary, it is understood that: There are no warranties, expressed or implied, including any warranty of merchantability or fitness for any particular purpose. While all data presented in Seller’s technical publication is based on the best information available to Seller, and is believed to be correct, such data is not to be construed as a warranty that the product(s) will conform to such specifications. Such technical publications are subject to change without notice. The liability of Seller shall not exceed the purchase price of the products and Buyer shall not be entitled to, nor Seller be liable for any consequential, incidental, indirect, or special damages in such manner from the furnishing of the product or for any damages of any kind arising from the use of this product.